Dyspnea (pronounced as ‘disp-ne’ah” is characterized as the inability of an individual to take a satisfying deep inspiration. This is an extremely weird definition, and there are good chances that it was invented by proponents of breathing more – as if breathing more than the medical norm is going to offer additional health benefits! This short YouTube video “Shortness of Breath (Dyspnea)” features Dr. Artour Rakhimov who explains development of dyspnea in people with chronic diseases. The major cause of dyspnea lie in the changes that have taken place in air composition during the past 2 million years. When the very first prototypes of lungs started evolving, the air consisted of about 7-12% CO2, and less than 1% O2. This was prior to the time when green life was advanced. As a result, overbreathing proved highly beneficial for increased tissue oxygenation. However, the situation has truly reversed now, although humans continue to possess this ancient pathological reflex known as ‘dyspnea’. In modern times, overbreathing has the potential to reduce body oxygenation, which has the potential to intensify the desire to breathe, thereby creating a vicious circle. Dyspnea is basically triggered by overbreathing or deep breathing, chest breathing and mouth breathing. All of these activities have the potential to cut down on body and brain oxygenation, and trigger the feeling of air hunger. To begin with, let us initially provide a bit of evidence related to chronic deep breathing in people who suffer from dyspnea. Just imagine, how would you feel while waiting to acquire your test results – that’s how the shortness of breath triggered by dyspnea is going to make you feel. Minute ventilation rates (chronic diseases) For references, visit NormalBreathing.com. 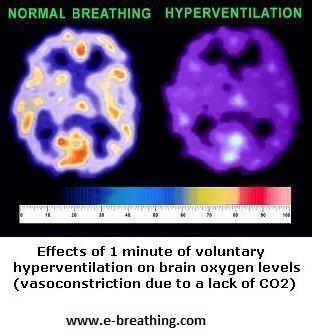 Overbreathing, or chronic hyperventilation has the potential to trigger alveolar hypocapnia or CO2 deficiency. This is fairly normal, particularly in people who suffer from asthma, heart disease, cancer, COPD, diabetes, cystic fibrosis, and many other conditions including pregnancy. The known effect of overbreathing is low brain oxygenation. It is just about impossible for one to perform healthy, normal breathing, for the simple reason that it is extremely small – 500 ml for tidal volume, 10-12 breaths/min, and 6 L/min for minute ventilation at rest for a person weighing 70-kg. On the other hand, dyspneic patients have more than 12 L/min for their ventilation rates, and more than 18 breaths/min for respiratory frequency at rest. If truth be told, all of these simple ideas are literally unknown to a majority of doctors – the same can be confirmed through this article on Wikipedia, which is dedicated to dyspnea. Hyperventilation has the ability to trigger increased work of breathing. This is caused mainly because of large minute ventilation rates. However, there are other effects that it can lead to as well. For instance, alveolar hyperventilation just about always triggers cell hypoxia, irrespective of ventilation-perfusion ratio. For instance, physical exertion, caused by anaerobic cell respiration at rest, and elevated resting blood lactate worsens the exchange of gas, and triggers the onset of overbreathing. This can cause acute exertional dyspnea. Acute dyspnea can further trigger even heavier breathing, which is caused by negative feedback in breathing control. This is due to a substantial oxygen driver or air hunger, rather than normal CO2-based regulation of respiration. Low brain-oxygenation is senses by respiratory receptors that are located in the brain, which creates a feeling of air hunger, thereby trying to enhance ventilation. You will be able to get rid of most symptoms related to dyspnea the moment you get more than 20 s for the body-oxygen test. Although this number is 2 times less than the medical norm of 40 second, it still is sufficient enough to help you resolve problems with shortness of breath at rest. However, over 30 s for body O2 test is required to be totally free from symptoms of dyspnea and cure it completely and naturally. Success.